Other Products by Tribeca Health. Search other Protein Powder products. 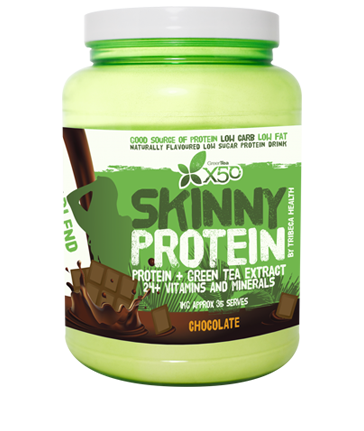 Skinny Protein is the exciting new release by the makers of Green Tea X50, Tribeca Health. Skinny Protein utilises 'Isotech' a blend of premium quality whey protein isolate and whey protein concentrate. Skinny Protein is designed to increase lean muscle and support fat loss and weight management. Providing18g protein per serve along with L-Carnitine, Schizandra and fibersol-2, Skinny Protein will increase the use of fat for energy, increase metabolism and keep you feeling fuller for longer. Skinny Protein is ideal for a meal replacment or snack, containing 24 plus vitamins and minerals. It is high in essential amino acids and naturally rich in BCAA's to provide immune system support and create an environement which enables protein synthesis, leading to an increase in lean muscle and aiding the fat-burning process. Providing less than 1g of fat and 1.5g sugars per serve, Skinny Protein is the ideal choice to assist your goals of a lean, toned physique. INGREDIENTS: Protein Blend (Whey Protein Isolate & MIlk Protein Concentrate, Fibersol 2, Cocoa, Vitamin & Mineral Blend, Natural Flavours, Salt, Acetyl L-Carnitine, Sucralose, Schizandra Extract, Digestive Enzyme Blend (Protease 1, Protease 11, Amylase, Lipase and Lactose). Contains Milk & Soy (Lecithin) Ingredients. This product was manufactured in a facility that processes Egg, Peanut, Oat and Barley. ALLERGEN STATEMENT: Not present in product: Bee Pollen, Milk and beverages made from soy or cereals (if no more than 2.5%m/m fat), Aspartame, Quinine containing foods, Guarana (or extract), Phytoserol esters & oil Phytosterols, Added caffeine, Unpasteurised egg, Unpasteurised milk, Royal jelly propolis, Erythritol, Isomalt, Polydextrose, Sorbitolz, Lactitol, Maltitol, Maltitol Syrup, Mannitol, Xylitol, Any irradiated ingredients, Sulphites - added >10mg/kg, Cereals containing gluten and their products, Egg and Egg products, Fish and Fish products, Soybeans & their products, Traces Peanut, Tree Nuts and Sesame Seeds (excluding coconuts).